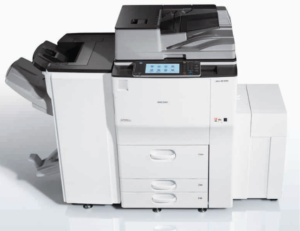 The Ricoh Aficio MP 7502 and MP 9002 are the perfect copiers for the business owner that needs a fast and reliable machine that efficiently prints the highest quality of black and white copies. The Ricoh Aficio 7502 offers a variety of multi function copier and printing solutions for your business that needs plenty of fast, quality prints. This black and white copier will save you money over its color copier counterparts, while still offering 1200 x 1200 DPI on all copies. The quality of the prints will speak for themselves and the professional look will satisfy you and your customers during your entire lease. It is also the perfect machine for those who have a high volume of copies needed in a short period of time. The Ricoh Aficio 7502 can print up to 90 prints or copies in a minute, making it the perfect machine for your thriving business. All Ricoh copiers are cloud compatible, combining the quality you expect from your professional copier with the convenience that wireless technology can bring. All features are designed to simplify even you most complicated jobs, taking the worry and hassle out of all your copy and print problems. With integrated data management technology and security feature options, the Ricoh Aficio line of copiers makes it easy to track and protect the files most important to you. It can help keep your files in line in a simple fashion, while protecting the private information your clients do not want falling into the wrong hands. If the Ricoh Aficio 7502 sounds like the solution you have been looking for, then please contact one of our experienced representatives today!